Directions For locating affiliated areas of Saint Anne's Hospital, please refer to our Fall River Campus Map found on our directions page. Founded by the Dominican Sisters of the Presentation in 1906, Saint Anne’s Hospital in Fall River, Massachusetts, is an acute care Catholic hospital with 211 beds and satellites in Attleboro, Swansea, Dartmouth, New Bedford, and Stoughton, Massachusetts. Fall River, Mass. – The need to understand medical information, diagnoses, and directions accurately is crucial for making decisions that affect one's own treatment, or that of a loved one. Since 1992, Saint Anne’s Hospital has been providing interpreter services to its patient population, allowing them to directly access the care they need while actively conversing in their primary language with their health care providers. During the past year alone, Saint Anne’s Hospital’s medical interpreters have handled almost 67,000 interpreter sessions. 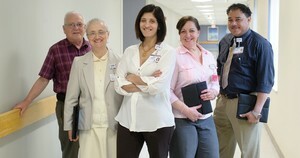 These patients – whose visits may range from the hospital’s surgical centers in Dartmouth or Attleboro, to the Pain Management Clinic in Swansea, and the myriad inpatient and outpatient services on the hospital campus – have the reassurance that, no matter what language they speak, they will have the services of a qualified medical interpreter to help them navigate their care. In-person interpreting: From the time patients arrive and throughout their care, Saint Anne’s Hospital in-person interpreters ensure that patients and their caregivers understand each other. The hospital’s team of 12 interpreters has undergone rigorous training that reflects not only a command of their second language, but also the medical terminology and nuances associated with each different language. Saint Anne’s interpreters speak the community’s three most prevalent languages – Portuguese, Spanish and Cape Verdean Creole – and many are fluent in more than one language. Video interpretation: In 2015, Saint Anne’s Hospital was the first in the region to offer this advanced, cutting-edge technology. If an interpreter is not readily available in person, hospital staff bring an interpreter to the patient via a real-time video platform. This interactive service currently offers 24 languages, with more to come in the near future. An automated interpreter telephone triage system that connects an interpreter with Portuguese-, Spanish-, or Cape Verdean Creole-speaking patients or families who call by phone from outside the hospital. This system allows patients to request an interpreter who will call them back and stay on the phone with them. This enables them to speak directly to hospital staff and their providers to ask questions, reschedule appointments, or check on loved ones within moments of their call. Founded by the Dominican Sisters of the Presentation in 1906, Saint Anne’s Hospital in Fall River, Massachusetts, is a full-service, acute care Catholic hospital with 211 beds and satellite locations in Attleboro, Swansea, Dartmouth, New Bedford, and Stoughton, Massachusetts. A member of Steward Health Care, Saint Anne’s provides nationally recognized patient- and family-centered inpatient care and outpatient clinical services to patients from surrounding Massachusetts and Rhode Island communities. Recent recognitions include “Straight A’s” for patient safety since 2012 and the 2017 Top Hospital award from the Leapfrog Group; Women’s Choice Awards as one of America’s best hospitals for cancer care and orthopedic care; dual Patient Safety Excellence and Outstanding Patient Experience awards from Healthgrades. Saint Anne’s key services include Center for Orthopedic Excellence; multiple robotic-assisted surgical capabilities; Saint Anne’s Hospital Regional Cancer Center; two ambulatory surgery centers; the Center for Pain Management; a spine center; and inpatient geriatric psychiatry services.